Evolution World™ Recycled Hot Cups are made with 24% post-consumer fiber, the highest amount on the market today. That means that nearly a quarter of this material already lived a previous life somewhere else entirely. So after this paper was done galavanting around the world as art projects, office memo's, love letters, and shopping lists, we found it another life to live. 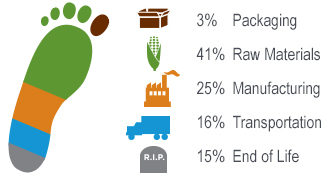 Who knew recycled materials in everyday things like your coffee cup had such juicy secrets to tell? Our 10 oz recycled content coffee cups are perfect for tea. Choose our 12 oz recycled hot cups for tea and coffee. Use the 16 oz recycled hot cup in your cafe today. Pick the 20 oz eco coffee cup when your customers demand something different. 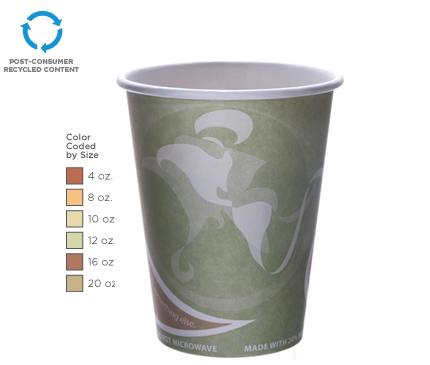 The small white recycled content cup lids are the lid choice for our 8 oz recycled content hot cups.